It is months, and months, and months since my editor asked me to do this review. I’ve put it off because of the complexity I discovered it demanded. For such a short book on such fleeting themes it has such depth and requires a work of careful, patient, sifting through quotes in pursuit of meaning. I’ve put off completing a review, but I have not put off the book entirely. I read it ages ago, and have often carried it round since (so small, light, attractive), reading it again and copying out chunks of text under theme headings in my notebook. As I write now, I’m aware that I’m writing in what I imagine to be Nathalie Léger’s voice – at least the voice given to her in this English translation by Natasha Lehrer and Cécile Menon, founder and director of Les Fugitives, who published it. Because that is what this book does: it seeps into you; you’re not entirely sure what it’s saying, but its voice is there, incessant, plaintive, addictive. And what I’m writing about now – procrastinating in my assignment, getting far too involved, not knowing when or where to stop – is exactly what Léger does in the book. It’s its entire point. 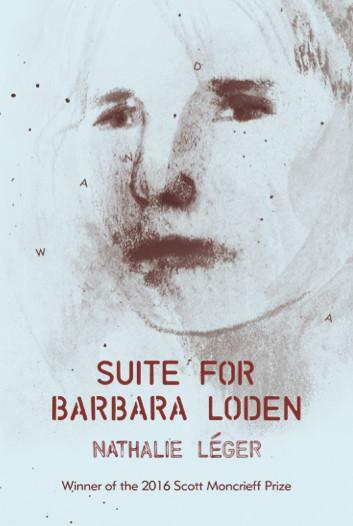 Suite for Barbara Loden is a short book, but it was going to be much shorter. Nathalie Léger explains that she was asked to write a short entry – une notice – for a film encyclopaedia (the French is referred to here by the translators for the formality, authority, and sense of presentation implied in the word notice, compared with “entry,” which seems more passive – something slipped into a larger thing, something without significant requirements). The subject of the notice was Barbara Loden – “the American actress and director,” reads the most encyclopaedic description contained in what resulted of the notice: this book. Convinced that in order to keep it short you need to know a great deal, I immersed myself in the history of the United States, read through the history of self-portrait from antiquity to modern times, digressing to take in some sociological research about women from the 1950s and 1960s. We watch her research expand to the point where she knows she can no longer write the notice. Much of the book deals with the meaning and implications of reduction and representation. It contains the idea of the scraps of research that are left over when a work is produced: this book is made of those scraps. Imperfect definition […] usually used to present singular people or individuals. A description is thus the gathering of accidents by which something may be easily distinguished from some other thing. The book is evidence of the impossibility of reducing an individual to a notice, and yet almost the more we learn about Barbara Loden in the text, the less we feel we know her; she remains absent, sketched, and peripheral – less pinned down than she would be in a notice. A young woman abandons her family and becomes involved with a man whom she helps to commit an armed robbery. The man is shot during the robbery, the woman imprisoned. This is the plot of Wanda, the 1964 film directed by Barbara Loden, which was inspired by a story she read in the newspaper. Loden plays the title role of the film, which was the only one she directed. Léger hooks Suite for Barbara Loden around the film script of Wanda in a narrative that weaves between descriptions of scenes, facts about Loden’s life, and juxtapositions with Léger’s own circumstances to form something unlike anything I’ve read before. Léger creates an impression on the page of Loden’s film, the way the film itself is an impression of its protagonist, and therefore of its director. I am struck by a Russian doll image. What we’re reading is the condensed representation of a representation of a representation. This representation being translated by women potentially extends the pattern, as does me writing this review. — What about this one, is it too transparent, or not transparent enough? — It depends on whether you want to show the truth. — What does the truth look like? — It’s between appearing and disappearing. The figure in the rubble is nothing in a landscape of nothingness that is between appearing and disappearing. ‘What are you looking for?’ I should find a balance between involvement and detachment, but I don’t have time to adjust my position. I tell him I don’t know. I can’t tell him that I’m desperate to find Barbara Loden’s journal. Suite for Barbara Loden is a portrait of Barbara Loden and Wanda seen through French eyes. It was ripe for translation into English because it is inherently bilingual and transcultural. Part the story of Barbara Loden in Hollywood, part the story of Nathalie Léger as a writer, a woman, and so on, it plays a constant game of exchange between two languages and cultures. He tells her that he can’t hire her, not that there isn’t any work, there is work csiou– looking straight at her, eyes magnified by his spectacles, calm, he enunciates clearly, There is work, but you’re just too slow. The shifts between film description, biography, and memoir produce a fragmentary effect; and we can assume that the translation method chosen for the English version – two translators rather than one – complements and builds on this. While there is no rupture in the voice that narrates and knits together the different passages, moments, and narrative formats, the two-voice translation at least conceptually adds an extra element of fragmentation. Wanda walks into a bar and sits down at a red Formica table in the window. We don’t know the city but as soon as we see the window, the Formica table in the corner, the curtains with thick folds that smell of beer and cigarettes, we know that this bar in Pennsylvania stands on the steep slope of misery. The repetition of ‘Formica table’ fragments the flow of the sentence, drawing attention to the detail, and helping to cement the image and its significance in the reader’s mind. I surmise that such repetition is employed in the original, serving to heighten the fragmentation effect owing to its rarity in the language. Léger identifies the presence and influence of French culture on Barbara Loden, spattering references to Godard, Duras, Perec, Céline, Zola, Flaubert, and Maupassant throughout the text, drawing on quotations by French actors in Cahiers du Cinéma about the nature of acting or filmmaking, and so on. Wanda is essentially a very “French” arthouse film, which received little attention in its home country. [It is the] story of […] a woman who leaves her husband, her children, who breaks up […] without having thought about it, without even wanting to break up. I had done all I could to enable my mother to visit Ganagobie […] forgetting that I could merely offer her what’s real; whereas the thing that her dream, her grief-stained fantasy demanded, was to never be satisfied. She wants to know why I went to America – why did you go so far away, what did you think you would find? It’s a serious question. I suppose I ought to answer it simply, conveying in an orderly fashion, two or three sentences at most, what a self-evident process it was. We aren’t looking at each other, and thankfully the movement we make as we prepare our lunch allow us to break off the conversation at random. Contained in this passage are the themes of the self and its representation, the directionless wanderings of a female protagonist, the impossible requirement to answer “simply, [… and] in an orderly fashion,” and fragmentation, which form the essence of this novel. […] leaving the courthouse in Grasse, having lost as a result of the violence that had been inflicted on her all sense of congruity with herself […] she wandered for hours around Cap 3000 and then, at dusk, how she drove down the coast all the way to Nice where she had lived as a child, thinking of nothing, feeling nothing […]. […] she caught the eye of a woman who was swimming at the bottom of the pool, right there, so close to her, gliding, feeling her way, staring through the portholes as if she had caught a glimpse from beyond the grave, watching, searching for something that was lost, and then swimming up to the surface, coming back, smiling, going back up, fleeing very fast, and going back. I must leave my attempt at reviewing this translated novel here, reassured in what it has taught me about the impossibility of neatly condensed representation. This does not, however, excuse me of the apology I owe you for the delay in telling you my thoughts on this elusive and compelling work.